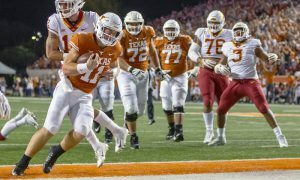 FORT WORTH, Texas — And the freshmen shall lead them? That was not Bill Self’s motto coming into this season. Sure, he expected to use one or two of the talented freshmen he recruited last year. Devon Dotson was a given. 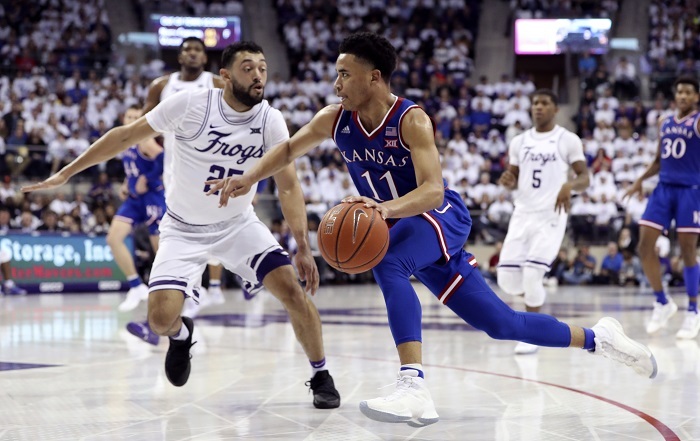 Kansas needed a point guard after the loss of Devonte Graham to graduation. David McCormack slipped in there based on his quality of play and injuries to Udoka Azubuike. But four of them? Four-fifths of his starting lineup comprised of freshmen? Self probably hoped he would never have to resort to that. But here we are. On Monday night for the second straight game Self had to start four freshmen. 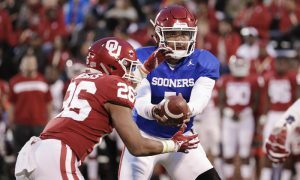 When he did it on Saturday against Oklahoma State, it was the first time since December of 2013 that Self had to start four freshmen. Those freshmen from 2013 are familiar names if you follow basketball. Joel Embiid. Frank Mason III. Wayne Selden Jr. Andrew Wiggins. They went on to do some incredible things for the Jayhawks and are all in the NBA. 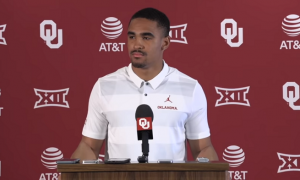 Only time will tell if Dotson, McCormack, Quentin Grimes and Ochai Agbaji will become the kinds of names that Self’s four freshmen starters back in 2013 have become. But on Monday night the quartet were integral to the Jayhawks’ 82-77 Big Monday win over TCU (17-7, 5-6 in Big 12). Kansas (19-6, 8-4) is in desperation mode right now. That’s a really hard statement to fathom for this program. But if the Jayhawks want to extend its streak of 14 straight regular-season Big 12 titles, the time is now and the margin for error is nil. So the desperation Kansas played with on Monday night? Well, get used to it. The attrition has been endless this season in Lawrence. The Azubuike injury. The Silvio DeSousa suspension. The Marcus Garrett injury. The Lagerald Vick leave of absence. The spokes in the wheel keep coming out and Self has to find a new one. And now that teams have dedicated themselves to making sure that Naismith Award contender Dedric Lawson hurts them as little as possible — he had 14 points and 10 rebounds before fouling out — it’s the freshmen that must step up to take the heat off Lawson and Self. And both did. Dotson had 25 points, 10 rebounds and 5 assists and made some critical free throws, even after he went to the floor hard in regulation. Agbaji had 20 points and 11 rebounds. Yes, Kansas had three players with double-doubles. 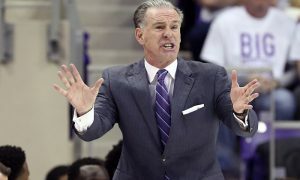 TCU head coach Jamie Dixon said afterward he wasn’t sure if he had seen a team that had three players with 10 rebounds each in a game. McCormack had 4 points and 3 rebounds. Grimes had 5 points and 2 rebounds. And K.J. Lawson played a big role off the bench, and while that deviates from the “freshman” theme of the night, his 10 points and 3 rebounds were invaluable, according to Self. TCU hadn’t lost at home in Big 12 play. Kansas had won just one road game all season. 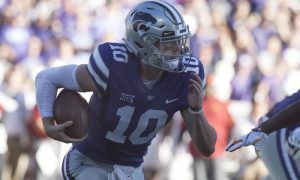 TCU played every bit Kansas’ equal on Monday, and the Horned Frogs have depth woes of their own. But four players hit double figures — Desmond Bane (18), Kendric Davis (16), Kouat Noi (14) and Alex Robinson (13). The Horned Frogs will be a pest for anyone in this conference in the remaining weeks and at the Big 12 Tournament. And, don’t forget — TCU beat Kansas in the Big 12 Tournament just a couple of years ago. TCU had a chance to win this game. Tied 69-all the Horned Frogs had the final possession. But their play call just didn’t work out. Robinson said the Horned Frogs called a play they liked, one that had worked in the past, and Kansas just defended it well. 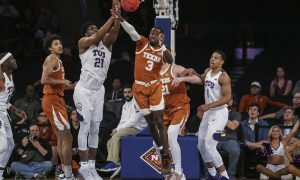 Dixon explored the theme further after the game and lamented how the Horned Frogs lost a four-point lead late in regulation. TCU is out of the Big 12 race at this point. Everyone knows that. Kansas is on the periphery of it. Self didn’t call Monday a must-win, but he implied it for certain. He knows that with five scholarship players he has to continue to win to keep this regular-season streak alive. It’s a source of pride. It’s not the end-all, of course. But if Kansas can get by West Virginia on Saturday in Lawrence — and you’ll see why that could be less of an issue in a second — they get a week off, something Self says they need. It’s well-timed. After the week off Kansas gets Texas Tech on the road, then Kansas State at home. That two-game stretch could define whether the streak lives or dies. Self isn’t counting his team out yet. He said Monday night this team hasn’t “hit its stride yet.” He’s right about that. This is a much different Kansas team than the one that he coached a month ago. It’s practically brand-new. The real question is whether this Jayhawks team can hit its stride fast enough to be ready for March Madness. It’ll be here soon enough. In the other Big Monday game, Baylor outlasted Oklahoma, 59-53. The Bears stopped the bleeding on a two-game losing streak as Devonte Bandoo led the Bears with 19 points. The Bears were without their starting guard combo of Makai Mason and King McClure. Jared Butler added 11 points. The win means the Bears are still in the hunt at the top of the Big 12 standings, remaining two games back of Kansas State. The Bears need some help, though, and they could get it if Texas helps them out against Kansas State on Tuesday. The Sooners got a team-leading 14 points from Kristian Doolittle. But the Sooners have now lost five straight and appear to be in a free fall. Meanwhile, West Virginia dismissed two players on Monday, and both are big names for the Mountaineers. Ahmad was averaging 12 points and 5.8 rebounds per game. Harris was averaging 7.9 points and 4.5 rebounds per game. Additionally, Texas Tech lost some depth going into Wednesday’s game against Oklahoma State. Moore played two minutes this season. 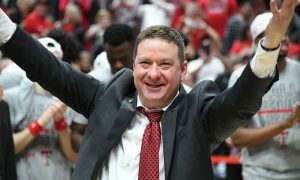 Red Raiders head coach Chris Beard said that Moore would still be eligible for a redshirt. 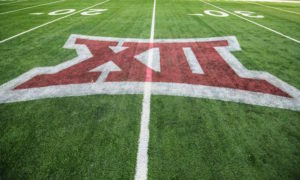 There is just one game in the Big 12 Tuesday and Wednesday nights. On Tuesday it’s Kansas State at Texas, and on Wednesday it’s Texas Tech at Oklahoma State. Both games are at 8 p.m.